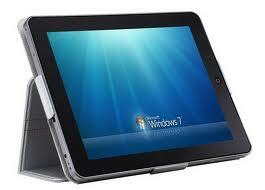 Home » windows 7 » What is the Perfect Tablet Computer for Healthcare? What is the Perfect Tablet Computer for Healthcare? However, there is a vast area of healthcare that the iPad just does not work at all. I am currently aching for a highly portable tablet computer to connect to my JedMed Digicam in order to video-record fiberoptic endoscopy, ear work under the microscope, etc. The software the Digicam works with is only Windows compatible (and from my conversations with JedMed, there's no plans to make it work on any other platform in the foreseeable future). As such, at this time, the Windows (and not iPad) world is the current way to go to address this deficiency. Not Google Android, iPad, Blackberry, etc. And WOW... I was amazed at the plethora of tablets introduced at the 2011 CES Convention Jan 6-9, 2011 in Las Vegas. There were over 80 tablets that were introduced from big name companies to nobodies. Surely, there will a be a few which fits the bill? Sadly, there were only a few that may fit my needs. The Dell Inspiron Duo may possibly work, but the swinging screen just looks way too fragile. What do others think? I'm pinning my hope on the Samsung model as the Motion tablet price is a bit much. The Samsung tablet is suppose to go on sale in March 2011 with a price tag around $699.